For most prisoners at the Netzweiler-Struthof concentration camp in Alsace, the fall of 1944 marked a time of disbursement to other detention sites — a clear sign that Allied forces were close at hand. But both the disbursement order (in mid-September) and the Allied arrival at Struthof (in November) were just a little too late for Jacques Stosskopf, who was executed by the Nazis on Sept. 1 that year, even as the Germans were beginning preparations to disband the camp. How he was executed is unclear; stories from witnesses differ about whether prisoners at the camp were hanged, shot or gassed. But it isn’t Stosskopf’s end that catches attention; rather, it is how he spent the war years, and his involvement, as a Frenchman, in the German U-boat war. A native of Paris (born Nov. 27, 1898, in the City of Light), Stosskopf was of Alsatian heritage and spoke fluent German. He joined the French artillery in 1917 and received the French Croix de Guerre for his actions in World War I. After the war, he entered the Ecole Polytechnique and earned a degree in marine engineering. 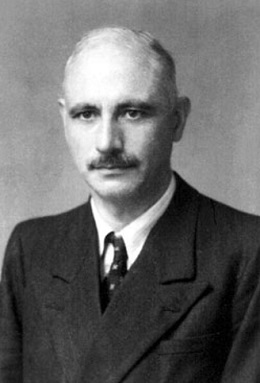 As World War II approached, Stosskopf was appointed to lead the naval construction unit at Lorient, on the French coast. He eventually was promoted to the rank of Chief Engineer, 1st Class. In June 1940, the German army took control of Lorient and began using the naval facility there to repair and resupply their U-boats. When they realized that the U-boats were vulnerable to attack by Allied air forces, the Germans set about fortifying the base as a refuge for their submarines. Stosskopf worked with the Germans to design the new U-boat station, creating one of the most famous and impenetrable naval bases of the war: the double roof over the bunkers allowed them to withstand even a direct bomb hit, so even though the city of Lorient itself was almost 90% destroyed by Allied bomb raids, the bunkers continued to stand. Between 1940 and 1944, the Germans built three such bunkers, capable of sheltering more than 25 submarines; from these fastnesses, German U-boats carried out relentless attacks against both military and civilian targets. Because of his involvement with the naval station, Stosskopf was considered a collaborator by the local French citizenry. So when he disappeared in February 1944, they assumed that he had been promoted by his German compatriots and had been called to work in Germany. In fact, all the while he was working on the U-boat port, Stosskopf had been collaborating not with the Germans but with the Alliance Reseau, a French resistance group headed by Marie-Madeleine Fourcade. Each week, he met with his resistance contact, providing information about boats going out to sea, the names of their captains, and the location of the missions. Because of these reports, many U-boats were intercepted at sea and their captains killed in Allied attacks. In the end, Stosskopf was given up by a captured member of the Resistance, and he was caught up in the German Nacht und Nebel (Night and Fog) program. This roundup of suspected resistors of the Reich was undertaken by the Germans as a last-ditch attempt to regain some control over a war they could see slipping away; Nacht und Nebel abductees were spirited away at night and disappeared “into the fog” — never to be heard from again. Stosskopf’s ultimate fate lay at Natzweiler-Struthof, a small concentration camp in the Vosges Mountains, in the Alsace region. Struthof, as it was called, was the only camp built on French territory, and it was the primary holding place for captured members of the French Resistance. At war’s end, the citizens of Lorient were amazed to learn the truth of Stosskopf’s activities, which were made public when he posthumously received the French Legion of Honour (1945). In 1946, the submarine base at Lorient was renamed in his honor. Today, visitors can tour the base at Lorient and see how it was operated. Arrested and deported by the Gestapo Feb 21, 1944, for his activity in the resistance. To get a personal look at Jacques Stosskopf, read Jacques Camille Louis Stosskopf 1898-1944, a book of documents and testimony about his life compiled by his children, Francois Stosskopf and Elizabeth Meysembourg-Stosskopf. On this date in 1945, Heinz-Wilhelm Eck and two of his former subordinates on the Unterseeboot U-852 were shot in Hamburg for killing the survivors of a sunk target. 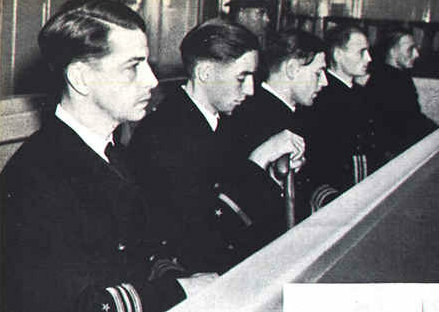 The defendants in the U-852 trial. From left to right: Eck, August Hoffmann, Walter Weisspfennig, Hans Lenz, Wolfgang Schwender. The leftmost three were executed. On March 13, 1944, in the South Atlantic en route to the Indian Ocean, U-852 torpedoed the Greek-flagged Peleus. The submarine commander Eck feared the steamer’s debris would be observed by a passing airplane, and give enough information to Allied reconnaissance to enable it to find his ship. He therefore surfaced and attempted to have the debris field eliminated by machine-gunning and grenading it into the watery deep. This seems a rather curious expedient, but evidently it was a common one. Q. What would you have done if you had been in Eck’s position? A. I would under all circumstances have tried my best to save lives, as that is a measure which was taken by all U-boat commanders; but when I hear of this case, then I can only explain it as this, that Captain Eck, through the terrific experience he had been through, lost his nerve. Q. Does that mean that you would not have done what Captain Eck did if you had kept your nerve? A. I would not have done it. Survivors of torpedo attacks usually had problems enough without the sub crew taking pains to attack them. Eck claimed that he worried that the survivors’ rafts might have communications equipment that would call out the sub-hunters tout de suite, but a standing German directive forbade U-boat captains assisting their prey. No attempt of any kind should be made at rescuing members of ships sunk, and this includes picking up persons in the water and putting them in lifeboats, righting capsized lifeboats and handing over food and water. Rescue runs counter to the rudimentary demands of warfare for the destruction of enemy ships and crews … Be harsh, having in mind that the enemy takes no regard of women and children in his bombing attacks of German cities. But in this case, some of the Peleus crew managed to survive the mop-up operation, and then the open ocean, long enough to tell their tale. The British military tribunal sentenced Eck to death, his plea of “operational necessity” (i.e., “I had to shoot the survivors to sink the debris to save my ship”) rejected; also condemned were the ship’s doctor Walter Weisspfennig, who wasn’t supposed to be involved in gunplay at all, and August Hoffmann. Both of them had taken the “only following [Eck’s] orders” line. Hans Lenz, who had opposed Eck’s order but ultimately complied with it, drew a life sentence. Wolfgang Schwender, who seems to have shot generally at debris but not (he said) at human beings, and then got bumped off his gun by the reluctant Lenz, got off the easiest at 15 years. Despite the predictable “victor’s justice” dynamic — American and British sub personnel, and even Japanese I-boat officers, evidently skated on similar conduct — Eck was the only U-boat commander in World War II to draw a war crimes conviction. That was surely due in part to the overwhelming majority of them having simply failed to survive the perilous undersea campaign long enough to see the inside of a war crimes court. * Part of the past-is-prologue contest for this case was the World War I sinking of the Llandovery Castle by a German submarine, which had then proceeded to hunt down the lifeboats. It resulted in (non-death penalty) war crimes convictions for some of the U-boat officers involved. The existence of this precedent helped to defeat the “superior orders” defense of the junior officers, since they could be held to have known that Eck’s command was illegal.